For the past few months, I’ve been working on one of my dream games: a tabletop role-playing game that simulates the otherworldly adventure stories of Hayao Miyazaki and Studio Ghibli. I wanted a rule set that emulated the motivations and values of Miyazaki, that rewards co-operation and community. I’ve been playtesting it and tweaking it for months now. 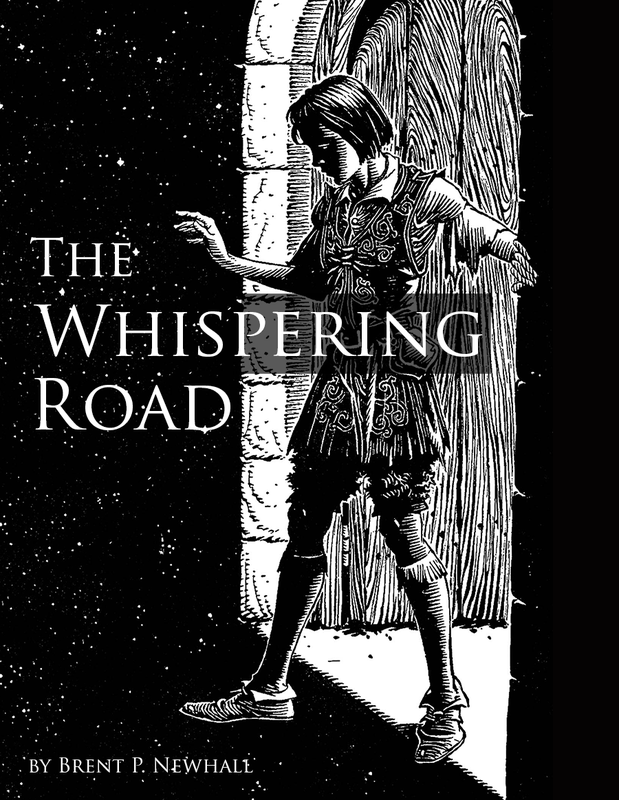 Today, I sent a limited release of the game, The Whispering Road, to my patrons on Patreon. The Wandering Road is ideal for introducing casual gamers to tabletop games, and also designed to be accessible for kids. There’s no adult language and all games can be completely non-violent. It’s a GM-less story game, which includes rules for creating characters and resolving conflicts. Characters are built from three pieces: an Archetype, a Need, and list of 5 Traits (the rules come with 4 Archetypes and 30 Traits to choose from; players define Needs collaboratively). There’s a 5-act story structure for simulating movie-like stories. This structure can even be abbreviated to 3 acts if you only have a couple of hours to play. I haven’t released it to the public yet, because this game deserves beautiful art. I’ve contacted a few artists, and once I have some sample art from them, I plan to launch a Kickstarter for the art, and once I have that, I’ll release the game publicly. 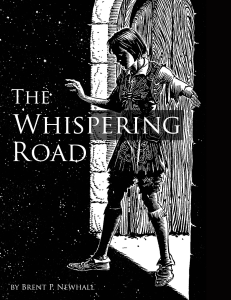 If you’d like to try out The Whispering Road, let me know, and I’ll try to set up a time when we can play online. There are so many opportunities for video and audio gaming online (Skype, Google+ Hangouts, etc.). One of the most fun experiences in my life is running a game I designed. The game’s never perfect. Players almost always suggest changes. And they almost always have fun. I’m going to describe what it was like to run Dungeon Raiders, which is my simplification of original D&D, during last year’s DC Game Day. I ran “Temple of the Ghoul,” a free old-school adventure I’ve run several times. I love it. It’s a mostly linear environment: one entrance, a few upper-level temple rooms, and a small complex of rooms underground. The heroes have choices, but not many. The system ran beautifully. Most of my players played early editions of D&D, so they became comfortable very quickly. Each class uses its own die for attacks, and you’re always trying to meet or beat 4. Nobody asked any rules questions after the first 15 minutes. Like most retroclones, Dungeon Raiders makes combat so simple that players tend to exercise their creativity. When every round of combat looks the same–one die roll and one hit–players chafe and start to move their characters around the room, asking about the environment and tactics. Unfortunately, I made one mistake: near the end of the game, while surrounded by zombies, the cleric gleefully cast Turn Undead. There’s no such automatic spell in Dungeon Raiders, and I told him with regret that his cleric couldn’t do that. He humbly accepted this and we moved on, but I realized that I had no reason to deny him. It wasn’t about to break the system, and this was a one-shot tournament game anyway. Nevertheless, we built to a climactic slowdown with the titular Ghoul, and the players destroyed him surprisingly quickly and claimed a room full of gold. Dungeon Raiders is completely free and available in PDF, mobi, and epub. A couple weeks ago, I played a game of the upcoming role-playing game Eternity with its designer, Mark Diaz Truman. Even though game is still in beta, the rules work well, and we had a great time. It’s a game of gods and their chosen people. Each player starts by defining a god’s name and sphere of influence. Then players starts defining specific aspects of the god, and here’s where things start to get really interesting. One player defines one element of his or her god, such as a priest, a child of the god, or the god’s home realm. Then, each other player offers additional facts or complications to that element (“The priest was initially an initiate of another god’s order,” “The child is beginning to chafe under your direction,” “Your realm is under attack”). One can always decline these, but players bid special points that are in short supply, so there’s strong incentive to accept a deep complication. There are several rounds of this, and once everyone’s done, everyone should understand each god’s influence, realm, and archons. 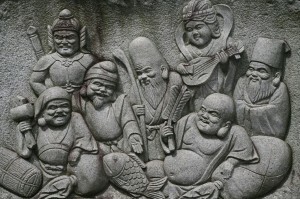 Indeed, usually each god looks over several chosen individuals by this point. The players do not role-play the gods; they role-play the gods’ archons and devotees. All of those characters defined in the earlier phase become fodder for conflict, so you play out confrontations between those characters, as they seek solutions to their problems. And if nothing else, one god can always send an archon on a quest into another god’s realm. The rules help players build powerful yet flawed characters. That’s the beauty of the system: conflict and tragedy flow naturally from the players’ choices. Because this occurs between characters who already wield supernatural power, the settings and stakes can be wild. We had one scene set in a miles-high M.C. Escher castle, where a godling faced the ghost of Cortez on a chessboard, surrounded by attacking playing cards from Alice in Wonderland. Every session must come to an end. And that’s where things get even more interesting: according to the rules, every session begins 50 years after the previous one. All your archons and chosen ones age and die as the game progresses. I’m deeply impressed with Eternity. I hope you get a chance to play. The Dresden Files RPG is the game built around the Dresden Files urban fantasy world, using the FATE system. I had an unusual experience running Dresden Files. During PAX East 2012, some friends wanted to try the system. I borrowed a copy of the rules from a booth selling Evil Hat merchandise (thanks, guys! ), and we grabbed a table in the cafeteria section of the conference center. As the players built their characters, we started brainstorming about the city we’d play in. The choice was obvious: Boston, the city in which we sat. We came up with lots of great ideas about Boston as a center of magical stories, and then…. I’ve dreamed up plots “on the fly” before, but I’d always built at least a few antagonists and ideas beforehand. This time, I had to invent a plot hook and involve the characters from the first minute. And it was magical. Pun intended. I created an incident in the basement of the Boston Convention and Exhibition Center, something really nasty involving a lot of blood. The characters were pulled in and quickly began investigating. The system should support stories that fit its world, and Dresden does so wonderfully. Your character’s Aspects define that character’s personality and powers, while skills define standard real-world abilities. You roll against those to determine how well you do something, and can invoke an Aspect for a boost. There’s a lot more to the system, but that summary illustrates one nice element of Dresden Files: if you know nothing else about the system, you can just roll against your skills. That’s how we familiarized ourselves with the system. I’m glad I grabbed the physical book. The book’s large amount of material makes it difficult to jump around, at least in PDF form. It’s easier to bookmark and flip through the physical book to look up a spell’s effects, sample NPC stats, etc. 4th Edition Dungeons & Dragons‘s modularity makes it suitable for many genres: the modern era, Spelljammer, and even the gonzo mutant future of Gamma World. For those unfamiliar: Gamma World was a D&D post-apocalyptic setting that included grenade-throwing rabbit-men, sentient plants, and crumbling radioactive cities. It’s a wonderful, ridiculous potpourri of post-apocalyptic elements. 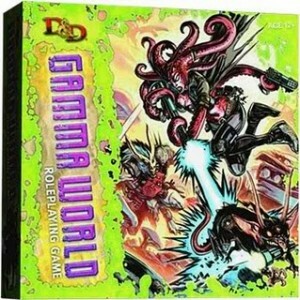 Gamma World 4E updates this with D&D 4E’s mechanical approach. A lot of people dislike 4E’s mechanics for being “too much like a board game.” Fortunately, Gamma World is ideal for such mechanics, since it involves skirmishes between groups with a wide variety of weird weapons. 4E models this world cleanly and beautifully. I ran Gamma World using one of the scenarios provided in the book, The Steading of the Iron King, which involved infiltrating a closely-held compound of Usagi Yojimbo knock-offs. I ran it as a Google+ Hangout using the Tabletop Forge add-on, which handled all our maps perfectly. We had a great time, blazing away at bad guys and dealing with cramped passages. It’s light entertainment, with plenty of options and a gonzo tone. What’s better: Rolling d100 or flipping a coin? Somebody mentioned to me a few weeks ago that rolling a d6 feels more limiting than rolling a d20. That’s certainly how it feels. It’s fun to find a combination of bonuses that leverage the dice in your favor, and a d6 gives you fewer opportunities to do so. Indeed, lots of potential bonuses would quickly overwhelm the die’s randomness. However, when examing the math behind a system’s mechanics, one finds that most designers work hard to keep the odds consistent. In recent editions of D&D, you’re generally rolling 1d20+2 vs. 10, or 1d20+22 vs. 30. Other systems will push those odds one way or another, but are still structured to keep significant margins of success and failure in all dice rolls. Now, crunching numbers to stack the odds is a very geeky pursuit. It’s part of a game’s “fun,” its long-term appeal. Geeks love figuring out how to maximize a consistent system. During the last +Indie+ convention, +E. Bryan Rumph playtested a coin-based game, The Coin’s Hard Edge, for me. I had a great time, partly because the coin flip made randomness clear. Your character will break the door open, or he won’t. The odds are obvious. If he doesn’t succeed, try something else, instead of spending 10 minutes searching for the right combination of skills, attributes, talents, gear, etc. to give you a slightly better chance. 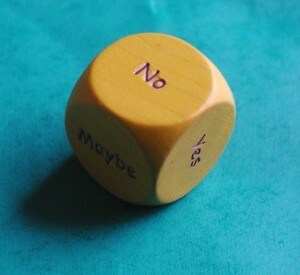 Why do we use dice in games? To introduce surprise. I thought I could swing from that rope over to the next building, but I fell into the courtyard instead. Now what? When players can greatly influence randomness, surprise fades. If we tighten our control of the dice too much, the game turns into poker rather than storytelling. New online video tools provide new opportunities for tabletop role-playing. Games that used to require face-to-face meetings can be played by people from around the world. However, these games are still being played with systems built for heavily scheduled, face-to-face gaming. What would a system built for this new world look like? That’s what I asked myself when building Hangout. Expect new players frequently. It’s much easier for someone who’s merely interested in a game to fire up their webcam on a whim than to drive 20 minutes to a stranger’s house. The players may not have the dice you expect, and players may not have access to useful online dice-rollers or other randomizers. The rules should be easy to grasp and use, at least initially for basic gameplay, even for those who’ve never played tabletop RPGs. There should be a free version of the rules. Dice and other randomizers are optional, and can be introduced later in play. Players don’t need to stat out their characters prior to play. Character stats are defined during play. This implies a pretty high-level system. If you need to crunch a lot of numbers to accomplish basic tasks, you’ll spend most of your first few sessions stopping to define stats and bonuses. The Hangout system takes some ideas from Risus and some ideas from FATE and applies them as follows. Your character will have a few Dimensions, which are catchphrases that define his or her personality. Example Dimensions include “Never tell me the odds” and “It belongs in a museum!” Each Dimension has a couple of points associated with it, and each player character has a total of 10 Dimension points. Most player-characters will have about 4 Dimensions. You can start play with no character concept, and define Dimensions as you approach conflicts. A conflict is a simple contest between two characters. Each chooses the most appropriate Dimension; the one with the highest points wins. The winner gets what he or she wants, while the loser takes a negative ongoing Condition (like limping, dazed, or drunk). This worked poorly in my diceless playtest, where the characters were investigating a strange hacker in the Grid of TRON. Player-characters’ Dimensions were usually close to an enemy’s Dimension, so they’d just win. If they were clearly outmatched, they’d invoke a DImension, and there weren’t enough conflicts to nearly exhaust anyone’s Dimensions. Reduce the number of points available in each Dimension. Increase the number of conflicts. Increase the expense of invokes. Perhaps an invoke reduces a Dimension by 50%, then to 0. Each has its pitfalls. I’ll have to playtest them to find out. When telling a story collaboratively–as in a tabletop role-playing game–how do you know when to move on? Particularly if you’re running the game, how do you know when to push clues towards the players, and when to have two thugs with guns burst through the doors? 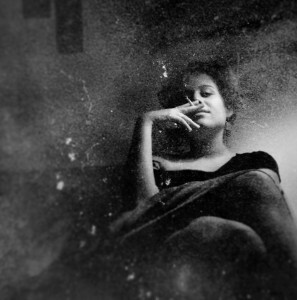 I’ve been playtesting a new noir game, The Coin’s Hard Edge, recently. While the mechanics work beautifully, it can be hard to know where one is within the twisting maze of a noir story. I was inspired to come up with a dramatic structure tool for Narrators. Final confrontation with the antagonist. So, yes, the tables could use more entries. But as an overall approach, what do you think? 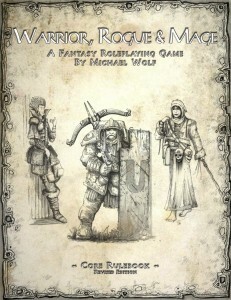 I love Warrior, Rogue & Mage because of its statistical approach to fantasy role-playing. It’s a beautifully simple system. 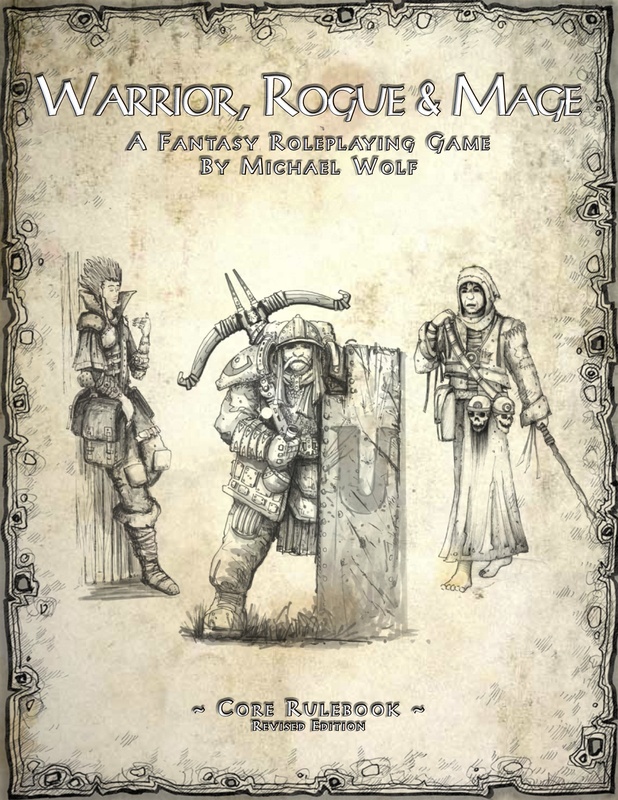 Instead of various attributes, races, and classes, WR&M uses three attributes: Warrior, Rogue, and Mage. Each player-character has 10 points total to divide among these three attributes. A character with many points in Warrior and few in Rogue or Mage is naturally a fighter of some kind. In addition, each character has a few skills — which are simply on or off; no ranks or levels — as well as a few talents (special abilities), and four derived attributes: Hit Points based on the Warrior attribute, Fate Points (allowing for re-rolls, ignoring deadly attacks, etc.) based on the Rogue attribute, Mana based on the Mage attribute, and Defense based on Warrior and Rogue. That’s it. To attempt an action, roll d6 and add it to the appropriate attribute. If the character has an appropriate skill, it adds +2 to the roll. If the result is equal to or higher than a target difficulty level (or the opponent’s Defense, for attacks), the action succeeds. Damage is rolled based on the weapon, and subtracts from Hit Points. Character concepts translate very directly to stats, as do actions. If I want to do something fighty or brawny, I use Warrior. If I want to do something sneaky, I roll Rogue. If I want to use magic, I use Mage. Even better, you can easily create a character that mixes two or all three of these. You can be the jack-of-all-trades, or an acrobatic fighter, or a hard-hitting battle sorcerer. Perhaps this is just because of how my mind works, but I found WR&M incredibly easy to grasp. The system got out of the way, while remaining closely relevant to characters’ actions. You can download it now for free. While at PAX East this year, I was determined to play a game of original 1974 Dungeons & Dragons, primarily to be able to say that I’d played it. Fortunately, I was at PAX East with the Gamer Assembly, and they were interested in the idea, too. We played the Temple of the Ghoul scenario, my go-to adventure for old-school gaming. It has a skittish village population, an abandoned temple on a hillside, stirges, powerful supplies if the heroes are aware enough to notice them, a kitchen heaped with eviscerated adventurers, and of course, the ghoul. 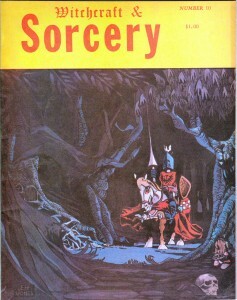 In the months leading up to PAX East, I spent many hours poring through the original 1974 D&D pamphlets and gleaning the relevant tables and mechanics for the players. The system felt like a dark dungeon itself, full of confusing passages. At the con, I gave the players a one-sheet summary of the core rules, and that’s what we used in play. Everyone died in the first fight. Fortunately, the players took this with good humor, and everyone re-rolled characters and dove back in. Within a few hours they had found the ghoul and finished him/it off. As expected, the system is relatively light and flexible, combat grows dull quickly if all you do is swing your sword, and there are a lot of awkward wargame-y mechanics (most of which we ignored in using my “core rule” sheet). The system felt half-formed, like a child’s version of D&D. This is nothing against Gygax and Arneson; they were still feeling their way towards a completely new mode of play. Expecting an elegant system by modern standards would be like expecting the Model T to drive like a Jaguar. Original D&D is a fine bit of engineering, though, that provides the raw mechanics needed to explore a dungeon and quell ancient terrors. If you want a bit of fun, you can find it in D&D.